Yield monitors are the logical first step for growers who want to begin practicing site-specific crop management or "precision agriculture." But if yield monitors are to be of any real value, the data generated from them must be incorporated into the decision-making, analysis, and overall planning process of the farming operation. Cotton growers and their consultants can now take advantage of two free webcasts to help them succeed in capturing and using this valuable data. The webcasts, jointly developed by Cotton Incorporated and the Plant Management Network, are titled: "John Deere Cotton Yield Monitor and 2630 Display" by Mike Buschermohle, Professor and Precision Ag Specialist at the University of Tennessee and "Using the Case-IH AFS Pro-600 Display to Record Cotton Yield Data" by Pedro Andrade-Sánchez, Extension Professor and Precision Agriculture Specialist at the University of Arizona. Through these two applied presentations, users can collectively learn how to: Operate the Case IH 600 and John Deere 2630 series display systems; Set up and use yield data highlighted in the displays; Download yield data and mapping; Bring the data into farm management software; and Monitor and use this data as a framework to develop site-specific management programs for fertilizer, water, and other inputs. The ‘Focus on Cotton’ site contains more than 25 webcasts on various aspects of cotton crop management. These talks, freely accessible 24 hours a day, 7 days a week, cover agronomic practices, crop protection, and ag engineering. Below ‘Focus on Cotton’s’ webcast section is a new and improved Cotton Extension Search tool where users can conveniently search for extension resources across all universities serving cotton producers. All of these resources are freely available courtesy of Cotton Incorporated at http://www.plantmanagementnetwork.org/foco. Cotton Incorporated recently announced the formation of a Cotton Research and Promotion Program Hall of Fame, which will annually recognize U.S. cotton industry leaders that have made significant contributions to the Program or to the cotton industry in general. 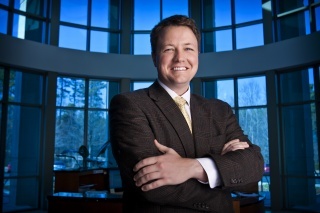 "As the Research and Promotion Program approaches its fiftieth year, we felt the time was right to acknowledge the contributions of those who have helped shape the modern cotton industry," says Berrye Worsham, President and CEO of Cotton Incorporated. The five inaugural honorees will be recognized for their achievements at the combined Cotton Board/Cotton Incorporated Board of Directors meeting in St. Petersburg, Florida this December. The honorees are: J. Dukes Wooters (New York), the first President of Cotton Incorporated, is recognized for his innovative marketing of cotton to consumers, including the development of the now iconic Seal of Cotton trademark; Morgan Nelson (New Mexico), known as "Mr. Cotton" in his home state of New Mexico, was among the first directors of the Cotton Incorporated Board of Directors. He is honored for his strong leadership and lengthy tenure in this role, in which he was instrumental in generating and maintaining grower support and helping to shape the direction of Cotton Incorporated; Marshall Grant (North Carolina), a staunch advocate of boll weevil eradication, is recognized for his foresight and tenacity in convincing local and national leaders to address one of the greatest threats ever to face the U.S. cotton industry. Heralded as one of the most successful USDA projects, the Boll Weevil Eradication Program also contributed to a reduction in pesticide applications and the implementation of Integrated Pest Management among U.S. cotton growers; Professor Lambert Wilkes, deceased (Texas) , along with his team at Texas A&M, is responsible for the engineering of the cotton module builder, which dramatically increased the efficiency of cotton collection and storage. In 2000, the state of Texas acknowledged the module builder as one of the four most significant economic achievements of the 1970s, alongside the opening of Dallas/Fort Worth International Airport and Southwest Airlines; and Fred Starrh (California), provided many years of leadership to the industry, first as Chairman of Cotton Incorporated and later as President and Chairman of Cotton Council International. He is honored for his strong leadership and for shepherding Cotton Incorporated through a transition of partnership with Cotton Council International to promote U.S. upland cotton around the world. The 2014 honorees of the Cotton Research and Promotion Program Hall of Fame were chosen from nominations made by Certified Producer and Importer Organizations and voted upon by the Chairman’s Committee of the Cotton Incorporated Board of Directors. You’ve seen The Cotton Board’s industry calendar and now The Cotton Board wants to see your best cotton photos. The Cotton Board Calendar Photo Contest was announced on their Facebook page on September 2nd and contestants have been asked to submit their best cotton photo. 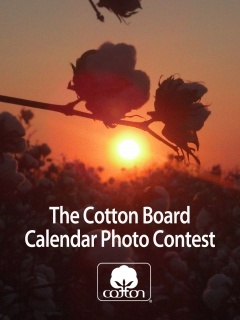 One winning photo will be selected and featured in The Cotton Board’s 2015 Industry Calendar. To be eligible to win, contestants must first "like" The Cotton Board Facebook page (www.facebook.com/cottonboard) and then email their high-res jpeg photo to sgorman [at] cottonboard [dot] org. Only one entry per contestant will be considered. The contest ends on October 3rd, 2014. Director of Communications for The Cotton Board, Stacey Gorman, said " The Cotton Board calendar has become an industry staple. It has been produced for over 20 years and is directly mailed to every cotton producer and ginner in the U.S. We hope the photo contest will get our audience engaged and excited about the 2015 edition of the calendar. "The winner will not only have their photo in the calendar, but will also receive a cotton prize pack including 25 copies of the calendar, a cotton t-shirt and other cotton memorabilia. Cotton prices around the world were generally stable over the past month. Although December futures have been testing higher values, they have yet to break decisively above resistance near 68 cents/lb and were range-bound over the past month with values trading between 65 cents/lb and 68 cents/lb. The A Index has been flat to slightly higher since early September with values ranging between 73 and 76 cents/lb. The USDA’s latest report featured an increase to global figures for 2014/15 beginning stocks and production, as well as a decrease to the estimate for world consumption. The combination of increased supply and diminished demand resulted in an increase to the forecast for ending stocks (+1.2 million bales). At 106.3 million bales, the current estimate for 2014/15 ending stocks represents 94.8% of expected mill-use. While supplies increased at the global level, they were revised lower for the U.S., with the domestic crop estimate reduced 1.0 million bales (to 16.5 million) and the U.S. ending stocks figure declining 400,000 bales (to 5.2 million). Despite widespread anticipation that news would be available in early September, details regarding the implementation of China’s new cotton policies have yet to be released. A statement issued in early September by the National Development and Reform Commission (the government organization responsible for cotton policy), indicated that details will be forthcoming and that the price monitoring process for determining payments to growers is already being implemented. While the specifics related to producer support are relevant to the global market, reserve management, and particularly the price at which cotton might be released from reserves in future auctions, is likely more important to world cotton price direction. If the eventual reserve auction price is announced at a level low enough that imports (plus tariffs) become a less profitable option, there is the possibility that quotas will not be used even if issued. Such a situation could lead to lower Chinese import demand than currently forecast. In turn, that would imply a further increase in stocks outside of China and additional downward pressure on prices around the world.